Date first listed, 29 March 1966. Marple Aqueduct was jointly designed by Benjamin Outram and Thomas Brown, the Consulting and Resident Engineers respectively, for the Peak Forest Canal Company. The contract for its construction was placed with William Broadhead, Bethel Furness and William Anderson on the 5 February 1795 and it is understood that the first stone was laid without ceremony in May 1795. The three arches were keyed-in in November 1798 and at the celebrations of the 'turning of the arches' it was recorded, '---- at which time Thomas Brown shall give a handsome Treat to such Account and in such a way, as Samuel Oldknow and he shall think most proper.' The aqueduct was filled with water on the 1 May 1800 although its construction was still incomplete. By August 1801 work was still underway but it seems that this was completed by the end of the year. In December 1817, a wing wall of one of the piers was found to be collapsing and remedial work was necessary to correct the problem. The aqueduct contains some 8,000 cubic yards of masonry and it unites solidity with elegance. The piers are on 72 feet 4 inch centres and the arches are semi-circular in form. The lower part is built of red sandstone, rough-hewn from nearby quarries at Hyde Bank, and the upper part is built of white hewn stone. The abutments widen in well-proportioned curves and they batter or diminish upwards in a similar manner. The skilful use of architectural features such as pierced spandrels, string courses, arch rings and pilasters of ashlar stone as well as oval piers and stone of different type and colour have created a structure that is superlative in its class. Its position, amidst the wooded valley of the river Goyt at Marple, gives it a bold and romantic character and it is deservedly scheduled as an Ancient Monument as well as being listed as a Grade I building. At the time of the aqueduct's construction, the river at Marple was known as the Mersey with occasional references to it being the Etherow. In 1898, the Director General of the Ordnance Survey agreed that the river Mersey, above its confluence with the river Tame at Stockport, shall be renamed the river Goyt. Overnight on the 9 January 1962, the north face (offside) of the east arch of the aqueduct collapsed into the valley below. This was caused by a leak in the clay puddle and subsequent freeze/thaw action of the very cold weather. There was a very real danger of the aqueduct being demolished, owing to high repair costs. After public remonstrations, including Drs Cyril T G Boucher and David E Owen, Bessie Bunker and even a Canadian Professor of Philosophy, it was eventually agreed that the aqueduct should be repaired. 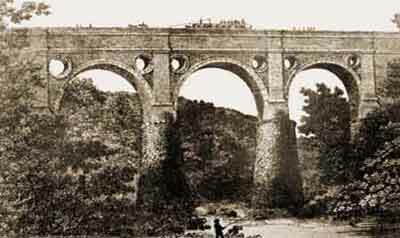 At one stage, it was recommended that the aqueduct should be demolished and the estimate for this, including placing a pipe across the gap, was £50,000. There was no mention of pedestrian access at this time. Local papers took up the cause and between January 1962 and May 1963 the restoration movement gained momentum. This successful outcome of this crisis led to the restoration of the Ashton and Lower Peak Forest Canals, including Marple locks. It also signalled a nationwide change in attitude towards canal restoration. 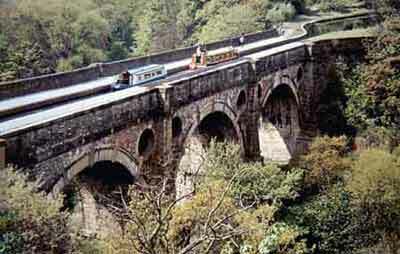 In September 1963, work commenced on repairing the aqueduct and it was completed in May 1964. It is understood that British Waterways offered £30,000 towards the cost of restoration in the knowledge that local residents and interested parties would also contribute. Painting of Marple Aqueduct, c.1809. In 2005, the painting was hanging on the stairs of Clevedon Court, the former home of Sir Arthur Elton, on the coast west of Bristol. 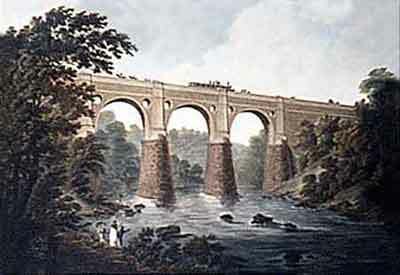 Portrayal of Marple Aqueduct. Marple Aqueduct, with Marple Viaduct in the background, early 20th century. Marple Aqueduct, August 1994.